With all the new tools like Twitter for Mac, it’s easy to forget that email is still a dominant form of communication online. I use Gmail constantly and I like to be alerted to new messages coming in without having a dedicated window open at all times, so with this in mind here are three options to get Gmail notifications onto your Mac desktop, plus a bonus usability tip that’s essential for any Mac webmail user. I’ve been using the GMail Desktop Notifier client for Mac OS X for a long time, it’s simple, unobtrusive, and sits in your menubar. The Gmail icon defaults to black, but the icon highlights red when you have a new message, and a number appears next to the icon displaying how many new emails are available. You can then click on the GMail icon to pull down and see an emails sender and subject. If you select an item through the menubar, Gmail will launch in the default web browser and open the message you selected. This is my top choice because of it’s simplicity. This requires the use of the Chrome web browser, but if you use Chrome anyway and don’t want another desktop menubar item, this is a great choice. You enable the feature through your Gmail settings (Gear icon > Gmail settings > General > Enable Gmail Notifications) and then you’ll get Growl-style notifications when new emails come in. The downside to Chrome’s Gmail notifications is that Chrome must be open with Gmail logged in at all times in order to get the notifications. Notify is another option that used to be a free solution but has developed many more features and turned into a paid utility ($10). Notify lets you manipulate email messages directly from the menu, get full message previews, and much more. Notify supports Gmail as well as just about any other web based email, so if you just use Gmail and want a simple notifier tool it might be overkill, however the app is gorgeous. Finally, you’ll want to round out your Gmail use by ditching some longstanding Mail.app behavior. If you’ve ever clicked an email address from the web and been bothered to see Mail launch, you can set GMail to open MailTo links instead by using a third party free utility called WebMailer. There’s a similar feature in the previously mentioned GMail Notifier for Mac client, but I’ve found that links in Safari tend to ignore the Notifier app and the only surefire way to get mailto links into Gmail is through WebMailer. If you just use web based email, this is highly recommended. Yeah, I use the GMail Desktop Notifier, and recommend it for a notifier; but I would prefer to have GMail itself not be so glacially slow to open (compared to other websites, and checking email on my email client). If I’m missing something obvious, I’d appreciate hearing suggestions/ideas/etc. for speeding it up! Gmail is slow in general these days, no one is sure why but Google is always “working on it” so they say. It’s something on their end, not ours as users. I used notify until I discovered Sparrow. Great desktop client for gmail! You can use gmail desktop notifier with growl if you install a seperate app called gmail+growl. I use Mail and GrowlMail. Works great and when I don’t want mail notifications, I just quit Mail. Which app adds nice CPU frequency and temperature in menu bar? I was trying to find one, but they either show or cpu FREQ or TEPM I couldn’t find app that could show both? 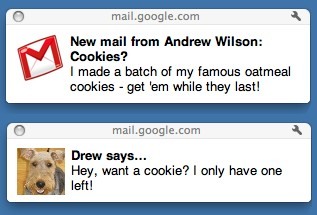 I’m wondering if you know of a way to get just Google + notifications on chrome without gmail notifications involved. Looking for something on OSX with Growl or something similar. I’m looking for a way to get notified when mentioned or someone replies to a post.